Harry Beresford Mcneary III and The Hoe Avenue Community Farm are making positive changes in the Bronx neighborhood of New York City, home of some of the nation's highest rates of hunger, obesity and diabetes, as well as underperforming schools, unemployment and incarceration. The project offers a community space for students and adults to receive gardening skills and organic produce. The farm is the second location for Harry's Urban Community Food Project, which works with public schools and youth groups, including juvenile disciplinary programs, to benefit Bronx youth both nutritionally as well as academically. Caroline Odera, an Akili Dada fellow working in Kenya, is providing women in the wetland and island villages of Lake Victoria with entrepreneurship development and business management skills through Women in Green Energy Enterprises and Savings Initiative (WEES). WEES promotes clean, safe and affordable energy sources, set up women-led energy enterprises such as solar charging stations for solar lamps and phones, hybrid bio-gas for cooking, and the sale of energy-saving cook stoves. These efforts modernize the energy sources within the area, help the environment, and create an income stream for women- run enterprises. Brianna Boertman has spent more than 15 years leading adjudicated, underserved and at-risk youth in month-long wilderness programs. Recognizing that most of the teen girls in the program were survivors of childhood abuse, Brianna began programs incorporating yoga, art and adventure for young women between the ages of 13-19 who are in foster care, receiving mental health services, healing from some type of abuse and trauma and/or living in transition from early recovery. Her SoulJourneys are three-, four- and eight-day therapeutic wilderness experiences that help teen girls find their voices, share their stories and become agents of change in their community and beyond. Artist Cheryl Miller's life was changed while working at Farm Sanctuary in upstate New York. She found particular meaning in the sanctuary's annual celebration of Thanksgiving, where turkeys aren't on the menu: They are the guests of honor. This year, she is organizing a community-sourced art project, 46millionturkeys, to recognize the estimated 46 million turkeys killed and eaten each year for Thanksgiving. Cheryl is collecting 46 million mini works of art, in media and techniques from paints and pencils to clay, origami and fabric, representing turkeys. All artists and non-artists are invited to participate and submit their work, and during the week of Thanksgiving, it will be displayed at the Harlow Gallery in Hallowell, Maine. The all-volunteer team of RedBird Books to Prisoners is dedicated to providing prison inmates in Ohio with free reading material. Many prisoners requesting books lack access to a prison library or educational programs. In addition to intellectual stimulation, books help inmates counter the isolation and institutionalism of prisons, provide them with important links to the outside, and improve their ability to reenter society in the future. Recently the program has expanded exponentially, with more than 200 book requests every month from inmates all over the state. 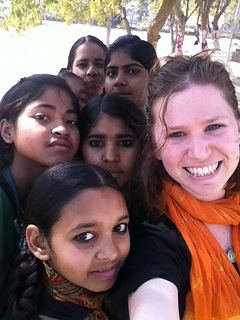 Theater teacher Melanie Closs worked in Anupshahr, India where 85 percent of girls do not receive a primary school education and are entered into arranged marriages by age 15. With theater classes, however, these shy, undereducated girls grew into confident, creative leaders. Melanie started The Other Side Educational Theatre, a storytelling, writing, and performance project creating an intercultural dialogue between 13-16 year olds in Brooklyn, NY and Anupshahr. The program is rooted in techniques from Theatre of the Oppressed that helps participants identify oppressors (in their own lives and in the lives of others), learn to get what they need, and learn positive ways to lead. For more than 20 years, San Francisco-based Tree has run community gardens, food pantries, shelters, and soup kitchens, and has published guides to help those in need find free places to eat and sleep. His Free Farm Stand offers locally grown, fresh and nutritious organic produce to all, especially low-income families and individuals; teaches those who have the space to grow their own food to become more self-reliant, and promotes good nutrition and health. The Free Farm Stand is now a gathering place in the Mission district, where increasing gentrification and high rents are pushing less affluent residents out. By collecting surplus food from various farmers markets, community gardens, private gardens, and public and private fruit trees, Tree is providing free food as well as a sense of community empowerment and engagement that is being lost. Congratulations to our grantees this week for their outstanding work. These are just a few examples of what a little seed money can do when put in the hands of someone with a vision and a plan to change the world. If you were given $1000, how would YOU seed the change? The Pollination Project makes $1000 grants every day, 365 days a year to individual changemakers. Please go to our website here for funding guidelines and application.